[This section has been updated since I first put this essay up in December '99. 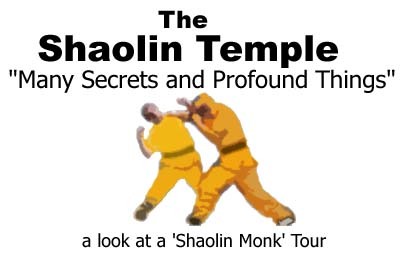 I've gotten a good bit of email, both agreeing and disagreeing, I thought it was a good idea if I expanded and clarified my view on the Shaolin Temple situation before I start talking specifically about the Shaolin Monk Tour scandals]. For those who may not be aware, the Shaolin Monks like you see in the movies no longer exist. By this I mean the historical Shaolin Monks, popular in Chinese history, folklore, literature and movies, who practiced Shaolin wushu while staying devote buddhist monks, living in the Shaolin Temple have disappeared. The temple was practically abandoned during the Cultural Revolution in China. What you find at the temple today is not what was there beforehand. The fact that the people you find in and around the Temple now claiming to represent it are not true monks is well known amongst martial artists in China. Jet Li himself is the best eyewitness, he went to the Temple in 1979 for the filming of Shaolin Temple and didn't find any martial monks. Read his remarks off his own webpage here. Furthermore it is a well known fact that martial arts masters from other parts of China were brought by the government to Shaolin in the 80's to reintroduce martial arts to the area. Presently around the temple there is a large number of private wushu schools, some of whom teach authentic Shaolin Wushu, but many of them also feature contemporary wushu (ie 'competition sport wushu'). Even if the people running these schools were buddhist monks (which many of them, of course are not), they would not be Shaolin Temple Monks (they would be "Monks who live down the street from the Shaolin Temple"). But then, are Buddhist monks supposed to be running a private martial arts school? Despite this fact, for many of these schools, their student's attire during wushu performances (if not practice) is the robes of Buddhist monks - kind of like dressing up like a Catholic priest during Halloween, somewhat sacreligious if you ask me. But what about the people that live and train IN the Temple? Well either way, we know they aren't direct, uninterrupted decendents from the historical monks. But still, you can ask the question: Are they true Buddhist monks? By that I mean they have taken the vows of a Buddhist monk (the same Buddhist vows that any monk, Shaolin or not must take and follow). There is a difference between a Buddhist and a Buddhist monk, just like there is a difference between a Catholic and a Catholic Priest, the standards of behavior within the religion are different, Monks and Priest are held to much higher standards of behavior than laymen. The behavior of the "monks" in the news and on these tours would lead you to believe that these people are not living up to those standards (see the update section at the bottom for examples). There very well may be true devote Buddhist Monks out there practicing Shaolin Wushu, but I'm afraid these people are a very small minority. As Jet Li alluded to, and anyone who has travelled to the temple and surrounding village can attest to, The Shaolin Temple and surrounding areas have been transformed into more of a 'tourist trap' by the Chinese and local governments and the local villagers in the years since the film. Dozens of martial arts schools popped up, some now quite large, with hundreds or thousands of students. Often times the instructors at these schools claim great pedigrees of martial arts knowledge ('Thirty-somethingth generation disciple of Shaolin Kungfu', for example) But here did these people come from? Where were they hiding from 1965 through 1980? Some journalists would lead us to believe that the government forced the monks to break their vows, leave the temple and assimilate into society, although I don't understand how the Red Guard can FORCE someone to get married and have children. Others mention that these monks may have been in hiding in the mountains during the Cultural Revolution, either way they certainly weren't living in the Temple and their sudden appearance in such great numbers lead one to be very suspicious. (three non-martial monks in 1980 to hundreds within a decade or two). Lately in America a number of groups claiming to be Shaolin Monks have been touring and performing on TV (programs such as Regis and Kathie Lee, Letterman, MTV, etc). It seems that these groups are most often from the schools outside of the temple, which means you're paying for people who aren't even from the Shaolin Temple, and aren't even monks either. So you're just getting people who have shaved heads and wear robes and perform wushu. But what are they performing? More often then not, it's not even Shaolin quan. It's Contemporary Changquan, Broadsword, etc -- and often times, not even that good, any professional in China would blow them out of the water. So what are you getting for your money? It's definitely not "Shaolin Monks" it's more like "People wearing robes with bald heads who might live near the Shaolin Temple who aren't even monks who aren't even performing Shaolin wushu." - Clearly these tours are misrepresenting themselves to the unknowing public and making money off of people through deception (which is fraud, last time I checked). The following is an email exchange I had with an individual claiming to be promoting a Shaolin Monks tour. These email are all the information I have about him, I do not know anything about him or his motivations but I thought I would share these email with the wushu community so they can see what happens when you try to ask one of these people details about their "Shaolin Monks." a close and long-term relationship with you if practical on your part. field and in good position please don't hesitate contact me. 4203/Email:____@netvigator.com   P.S. Your fax No..please! Your response would be appreciated,we remain. are Shaolin monks? Who are the performers? monks,performers and good coaches.Me?The one of two leaders. perpetuate any falsehoods on the public. Can you contradict this information? group comprised of true Buddhist Monks performing Shaolin Quan? technicians of Hollywood in England. The skeptic in me does not believe in the "secrets" of Shaolin. Give me some facts! I'm wondering what this "Hollywood in England" thing is, anyone know? This is the second time he uses the "Me(? ), ...." literary device, by the way. One thing to note is that he apparently is implying that Jet Li spent like two years in the area filming the movie Shaolin Temple and didn't know about the "secrets" or "profound things" hidden there. simply children who practice Shaolin Quan? attempt to abuse the name of the Shaolin Temple for self-promotion. I understand you well.In this world there's only one Shaolin Temple! Movie Stars will meet you for Gungfu Exchange,too. So now this man who sent me unsolicited email asking to cooperate with them in presenting a performance is asking me to prove my background to them once I start asking too many questions. I gave up on trying to get any answers out of this guy. I guess I should have been flattered that Abbot of the only one Shaolin Temple would write me an invitation letter, but that actually only makes me even more sure that this is phony. Who the hell am I? Abbots have more important things to be doing than inviting people who run webpages to visit and "exchange gungfu." The fact that meeting "Little Movie Stars" is being dangled out there is also suspect. Obviously this guy didn't look at my Famous Picture Page. Subject: Gungfu Exchange with Fighting Monks? you part.When reaching LA,I'll contact you. I assure that this email correspondence is presented completely and unaltered with the exception of the removal of the Monk tour guy's surname and email address. If anyone wishes to disagree with me or discuss more about the true status of the Shaolin Temple right now, please don't hesistate to email me. Update - 5/26/00: The People's Daily published an article on this subject giving the Chinese Government's position on this subject, CLICK HERE to view it. Update - 7/15/00: MSNBC has an interesting article on the Shaolin Temple and its "monks." I think the article is actually from the international edition of Newsweek. I don't agree with everything in it but it gives a clear picture of what a corrupt shame it all is. CLICK HERE to view it. Update - 9/24/00: Apparently there has been a great deal of turmoil around the Temple as of late. The local government (and/or the Head Abbot of the Temple) has been demolishing a good number of the schools and businesses near the Temple that I refer to above. This site has a good deal of information from sources in the village on the situation - www.russbo.com/destruction.htm (there are like 20 pages worth of stuff up here, but at least read the first couple). CLICK HERE for an alternate view from the People's Daily (an official news outlet of the Chinese Government). In my opinion, this situation only bolsters my arguments that the entire thing driven by people more interested in power and tourist dollars than Shaolin wushu. Update - 11/30/00: Here's a disturbing article on a murder near the temple of a student at one of the private schools I was talking about - Killing of Shaolin pupil, 14, shocks China (The Scotsman Newspaper).